Turn bedtime into a space odyssey with this stellar bedding set. Sleep, the final frontier. It's the voyage every parent takes when children must go where none have willingly gone before: a nap. And yet, with this astronomical bedding set from designers Peggy van Leer and Erik van Loo, little ones might just be counting down to bedtime. 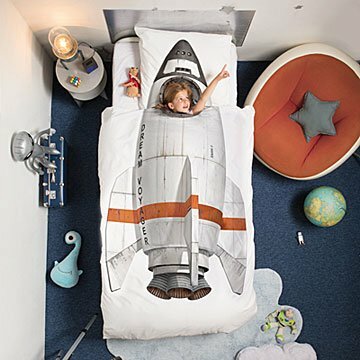 Featuring a high-quality print of a rocket that spans both the duvet and pillowcase, kids can climb in and launch themselves off to dreamland. Designed in the Netherlands. Made in Portugal. Includes duvet cover and one matching pillowcase.